Can Labor Unions and Electric Carmakers Get Along in California? In the waning hours of the legislative session, Democrats pushed through new labor requirement widely viewed as retaliation against Tesla, the electric car maker embroiled in a union-organizing campaign at its Fremont plant. Labor unions got lawmakers to insert two sentences into a cap-and-trade funding bill requiring automakers to be certified “as fair and responsible in the the treatment of their workers” before their customers can obtain up to $2,500 from California’s clean vehicle rebate program. At the time, Democrats openly wrestled with the concern that the United Automobile Workers, which is trying to maintain its role as the auto industry makes big bets on electric vehicles—was expanding its unionization campaign from the factory floor to the Senate floor. Sen. Steve Glazer of Orinda said the state should not “hold our environmental projects hostage to a fight with one progressive employer.” Sen. Connie Leyva of Chino countered that California shouldn’t want companies to succeed at the expense of workers. Now, with regulators starting to draft the new rules, a lingering question remains. How far will California—the first state in the nation to approve $15 minimum wage and a state that has set an ambitious goal to put 1.5 million zero emissions vehicles on the road by 2025—go in order to graft its blue values onto the green sector? Now state regulators—at both the state Air Resources Board and the Labor & Workforce Development Agency—will hold public hearings and draft rules for certifying automakers who want their vehicles to qualify for California rebates. The Legislature will then need to approve those. What is “fair and responsible” to auto workers? How will the state weigh wage and benefit standards, or training and safety requirements, against manufacturing costs? How will the state certify vehicles made outside of California or even out of the country, such as in Mexico and China, where wages are lower and labor regulations are less stringent? Or will automakers self-police by adhering to a code of conduct? Dean Florez, a former Democratic state lawmaker and a member of the air board, said California can have both labor protections and environmental leadership as the state charts new territory. While making $17 to $21 an hour is above minimum wage, Tesla employee Jose Moran noted that a living wage in the San Francisco Bay Area is a lot higher—around $28. Musk responded that Tesla’s compensation package is higher than General Motors, Ford and Fiat when including Tesla’s employee stock program. The nation’s newest automaker is also on track to be the first to max out on a federal tax credit of up to $7,500 per vehicle. And with its Model 3 sedans pitched as its affordable electric car at $35,000, Tesla will need California’s rebate more than ever to compete against other electric cars such as the Nissan Leaf or Chevrolet Bolt. Business boosters wonder why the state would single out clean-energy vehicles over gasoline cars for greater scrutiny when 40 percent of the state’s greenhouse gases come from tailpipe emissions. They worry Sacramento’s pro-labor stance will dissuade companies from locating or expanding in California. Already, Tesla located its first battery factory just outside the state line in Sparks, Nevada. Politicians say they want good-paying jobs, and to grow manufacturing and reduce greenhouse gas emissions, “and yet, we’re in the ironic place where Tesla is being attacked by some elected officials relative to whether or not their workers are unionized,” said Carl Guardino, head of the Silicon Valley Leadership Group, a trade association representing nearly 400 Silicon Valley employers, including Tesla. California is home to about 10,000 auto industry workers, virtually all from Tesla. That’s compared to 38,000 in Michigan, 24,000 in Kentucky and 20,000 in Ohio, according to the U.S. Labor Department’s Bureau of Labor Statistics. Union representatives say the goal is not to slow the production of clean energy vehicles. Rather, they maintain, if taxpayer money is being used to help sell cars, then it’s up to the state to make sure it results in good-paying jobs. The union also is trying to maintain its role as the auto industry makes big bets on electric vehicles. Just this year, Volvo and GM announced plans to phase out conventional engines. The union can also use a win in labor-friendly California after losing an organizing effort at a Nissan plant in Mississippi, a right-to-work state. It’s worth noting the Nummi plant that Tesla took over in Fremont was represented by the union before the joint venture between GM and Toyota closed in 2010. Sacramento has placed itself at the forefront of cleaning up the environment. Gov. Jerry Brown and fellow Democratic lawmakers have pitched California as a model to the world for reducing air pollution and greenhouse gases that contribute to climate change in direct response to the Trump administration’s anti-regulatory philosophy. But California has also had a longstanding relationship with labor unions, stepping up the minimum wage and offering access to paid sick and family leave. In recent years, the California Labor Federation has successfully pushed legislation to protect immigrant workers from threats of deportation and expanded authority for the state to go after employers who skirt overtime or minimum-wage laws. 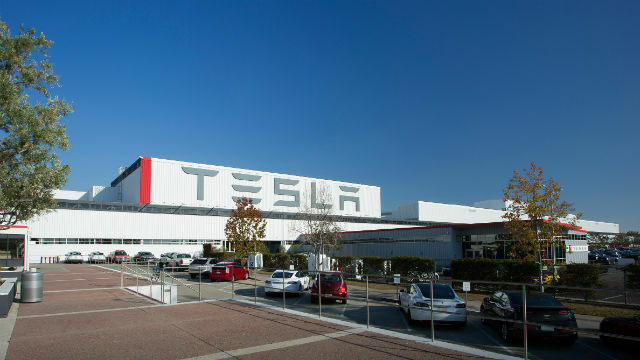 Lobbying reports show Tesla spent $189,237 on lobbying in the 3-month cycle during which the bill was debated, compared to $103,351 for the labor federation. But labor’s might comes also from being able to mobilize its members on issues and during elections. Democratic lawmakers who struggled to prioritize the interests of two political allies will have more to soul-searching to do next year. Democratic Sen. Scott Weiner of San Francisco, who has a record of advancing the green economy and supporting prevailing wage to maintain union pay on public works projects, said he was unhappy that the so called “Tesla rule” had been inserted at the last minute. “This is significant and important enough that it should be vetted through a normal legislative process with public scrutiny. That to me is the best way to come to the right solution,” he said. Ultimately, the decision to unionize remains up to workers. Michael Catura, 33, a battery pack line worker who has been at Tesla for nearly 4 years, said he supports joining the union because it would mean a higher wage and seniority for him. As the son of a postal worker, Catura said he has been disappointed that he has been passed over for promotions because supervisors can play favorites. He said he started at $17 an hour and now makes $21 an hour.